The 1,400-square-foot glass-and-steel art studio connects to the home’s garage. Resting on six concrete caissons, the addition appears to float above a wash. Architect Thamarit Suchart added full-height glazed windows to the southwest corner of the building to capture views of Camelback Mountain. The structure has garnered multiple design awards from the regional and local chapters of the American Institute of Architects. From building businesses to painting in his award-winning studio, artist Chad Little makes his mark. 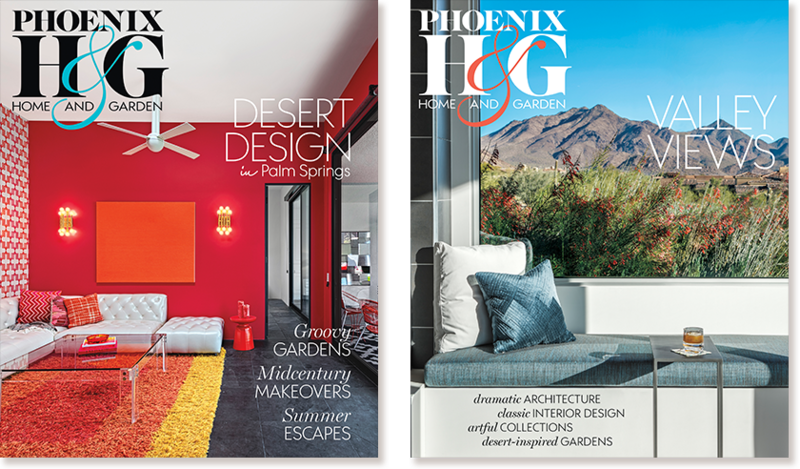 It’s a warm early-winter afternoon, and Chad Little is hard at work in his Paradise Valley studio, a sleek glass-and-steel building attached to the home he shares with his wife, Sophia, and their three rescue dogs, Max, Sasha and Geo. Bi-parting sliding doors on the structure’s west-facing side are open, allowing the day’s gentle breezes to waft in and fill the space with the fresh fragrance of the surrounding desert. The setting sun casts rays of golden light across a large canvas that Chad is framing. He is preparing for a solo show and charity fundraiser that will take place onsite the following evening. It wasn’t that long ago, however, that the artist was working in a completely different environment: tech startups. 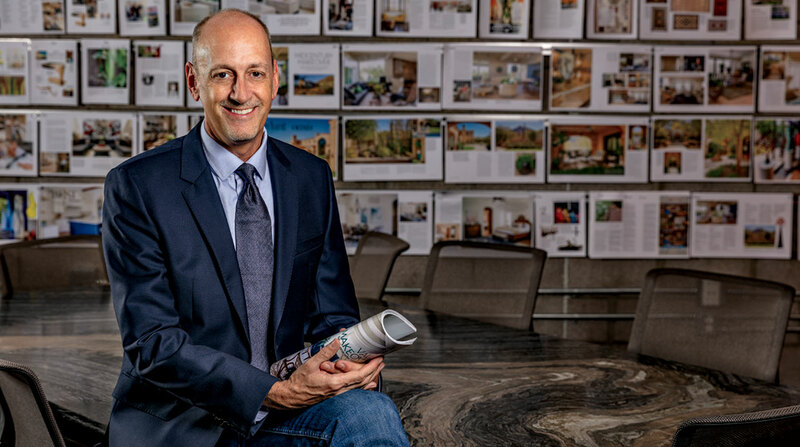 As the founder of Hivewyre, FetchBack and other locally based, Silicon Valley-embraced businesses, Chad was a highly regarded entrepreneur and CEO. But the need for a simpler pace and the desire for a solo enterprise led him to try his hand at painting, a skill in which he had no training or experience. “I always had art in my blood—or at least creativity,” Chad explains. “Even when I was an entrepreneur, the part I enjoyed most was the creative side of the business. I started five companies over the years, and it was always about ‘what’s the next problem to be solved’ and ‘what can we create.’ I never had as much fun once it was up and going because that wasn’t where the challenge was. “I realized that, at 50, I only have so many ticks in the heart left, so I wanted to at least dive in and see if I could [be a painter]. Plus, I’m an introvert, so I thought it would be nice to do something that was solely my own creation versus a collective. Put me in a room, let me slather paint on a canvas, and leave me alone,” he adds, only half-jokingly. Sunlight streams into Chad Little’s studio as the painter frames one of his works. His dog Max keeps him company. In just two years, Chad has become a formidable force in the Valley’s art scene. His representational mixed media and oil works have garnered praise from art collectors and critics alike. Rendered in soft midcentury shades—avocado greens, harvest golds, browns, pinks and pastel blues—the paintings, mostly figures and faces, recall the innocence and wonder of decades past. Women in vintage bathing suits frolic on the beach; a young boy in a Lone Ranger mask poses with his BB gun; an elderly man in a cowboy hat gazes longingly at an unseen horizon. The images are intimate and candid, their lines loose and random and their colors faded, like age-worn photographs found tucked away in the back of a small-town antique store. “I love great vintage photographs—the family shots that catch somebody off guard,” says Chad, who uses old pictures as inspiration for his art. “It’s a mood that jumps off the canvas,” adds Sophia. Amy Lofgren agrees. She and her husband, Nils, own several of Chad’s paintings, and they recently purchased one of his larger pieces, “Betty and the Birds,” which features a woman dressed in a ’50s-style pink outfit, surrounded by flamingos, on a distressed mint green and brown background. “I watched him create it on Instagram, and I thought, ‘I’d love to have that’,” she says. “I’m not a big fan of birds, and I don’t know who Betty is, but it was just amazing.” The nostalgic piece hangs on an original adobe wall in their 1931 home. For Chad, finding a perfect place to practice his art took some time. In 2011, he and Sophia purchased a 1954 home on a corner lot in the shadow of Camelback Mountain. “We had been looking for a contemporary home,” says Sophia, who notes that the couple wasn’t in a rush to move. About eight months into their search, while on a business trip, Sophia was browsing real estate sites when she came across the newly listed house. “I sent the listing to Chad and said ‘I think this is us,’” she remembers. “We looked at it on a Friday, and we put in a full-price offer on Saturday.” They spent the next couple of years remodeling. Black painted concrete flooring was ground down to reveal the natural aggregate; bathrooms were completely renovated; and busy stone countertops were replaced with streamlined concrete. In the entry hallway, concrete artisan Cody Carpenter fashioned a “floating” gallery wall. 1. The south-facing elevation of the Littles’ home features floor-to-ceiling glass walls. Large overhangs protect the interiors from the harsh desert sun. “Looking out of the house, you get these great views of Camelback Mountain,” says Chad. “But when you look back into the house from the gardens, it’s pretty incredible.” 2. Three movable partitions provide additional wall space for hanging art. When not in use, they can be stored in the attached garage. From left to right are “Sketti,” 24″H by 44″W; “The Neighborhood is Safe,” 40″H by 20″W; and “The Party Favor,” 30″H by 40″W. 3. “When I watched Chad on Instagram paint ‘Betty and the Birds,’ I thought to myself, ‘I love the look; I love everything about it,’” says Amy Lofgren, who purchased the painting during a recent gallery show at the Littles’ studio. 40″H by 98″W. 4. 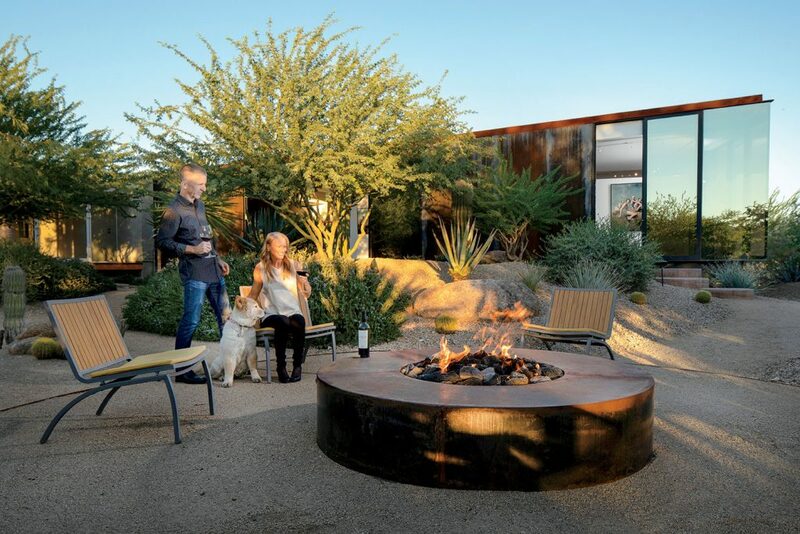 Chad and his wife, Sophia, enjoy a glass of wine by the fire pit. They’re joined by their rescue dog Sasha. “The couple had a beautiful existing garden, and we wanted to make the studio a backdrop for it,” says Suchart. 5. A concrete floating gallery wall greets guests at the Littles’ 1954 midcentury home. Artisan Cody Carpenter designed the feature with a picture rail that allows the couple to easily change out pieces on display. Seen on the wall is “That Perfect Summer on Lake Wawasee,” 52″H by 40″W. “Gammy and Smooch,” 30″H by 24″W, hangs in a niche by the front door. 6. A custom concrete, steel and glass table occupies the dining room. Carpenter designed the industrial-style piece around the home’s architectural aesthetic. “It fit the space perfectly and ties in with the exposed I-beam near the fireplace,” he notes. More of Chad’s art decorates this area of the house. On the gallery wall is “She Couldn’t Wait For Summer To Be Over,” 36″H by 36″W. “I came up with a simple solution of creating 4-foot-wide sectioned panels that are screwed to the wall using decorative attachments and fasteners,” says Carpenter, who notes that “gray is a great backdrop for colorful art.” A picture rail that runs the length of the wall allows the Littles to display Chad’s works or pieces from their personal collection. When Chad first began painting, he created a studio in one of the home’s spare bedrooms, but the space was too small and lacked the proper lighting he needed. He consulted with fellow Valley artist Fred Tieken, who had a stand-alone studio/gallery constructed in his backyard. “He said if you can do something on your own property, do it, because you’re not going to want to travel every time you get the urge to paint,” Chad recalls. Carpenter suggested he reach out to architect Thamarit Suchart to design the project. “As an artist, Chad understands our own artistry, so he let us have free rein, and I think that yielded the best project in the end,” says Suchart. The 1,400-square-foot minimalist addition extends southward from the home’s garage. Clad in weathered steel panels with expanses of mirrorlike glass walls, it complements and contrasts with the stucco and glass of the original structure. To minimize the impact on the landscape, the architects designed the studio to “float” above an existing wash. Six 36-inch concrete caissons, buried 10 feet into the ground, support the building. Floor-to-ceiling bi-parting doors, situated above the wash, slide open to allow views of the landscaping as well as a circular fire pit with seating. “When it rains, water flows underneath the studio,” says Chad. “It’s kind of cool.” A cluster of caissons at varying heights serves as entry stairs, their circular forms in sharp contrast to the straight lines and precise angles of the addition. “They’re like pieces of sculpture, but you happen to be able to walk on them,” remarks Suchart. Inside, the space is open and bright. Three movable partitions on casters allow for spatial diversity and increased wall surface for hanging art. When not needed, they can be stored in the attached garage. “It works out great, because Chad can have this big open space, and he can have paint flying everywhere and the dog covered in red oil because it brushed up against one of his works,” says Sophia with a laugh. Just a few short years ago, Arizona had the distinction of being one of the worst states in the nation to be a homeless pet. Valley shelters were overrun with lost and unwanted dogs and cats, a majority of which ended up being put down. In fact, in 2010, the state had the second-highest euthanasia rate in the country. Thanks to aggressive spay-neuter initiatives, however, that number has dropped significantly—upwards of 80 percent. But there is still a lot of work to be done. Sophia and her artist husband, Chad, are longtime philanthropic animal lovers. 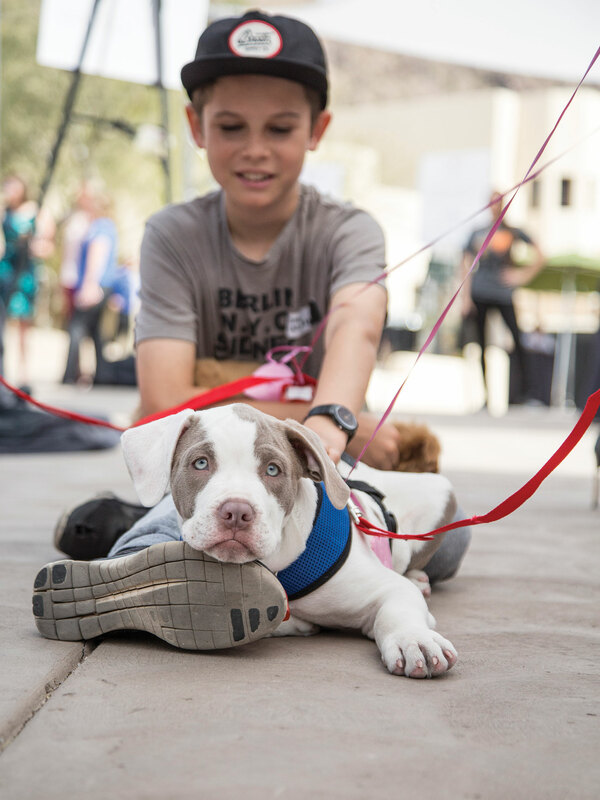 She has volunteered with numerous pet-related charities in and around Phoenix. He has donated large portions from the sale of his artworks to these same organizations; a recent gallery event at his home studio raised almost $17,000 that was earmarked for spay-neuter programs at the Arizona Humane Society. Together, the couple established SkinnyPigs Foundation, which provides funds and services to “boots-on-the-ground” causes here and in Costa Rica, where they own a second home. “I would say that 70 percent to 80 percent of the money we put to work so far has been around spay-neuter efforts,” says Chad. 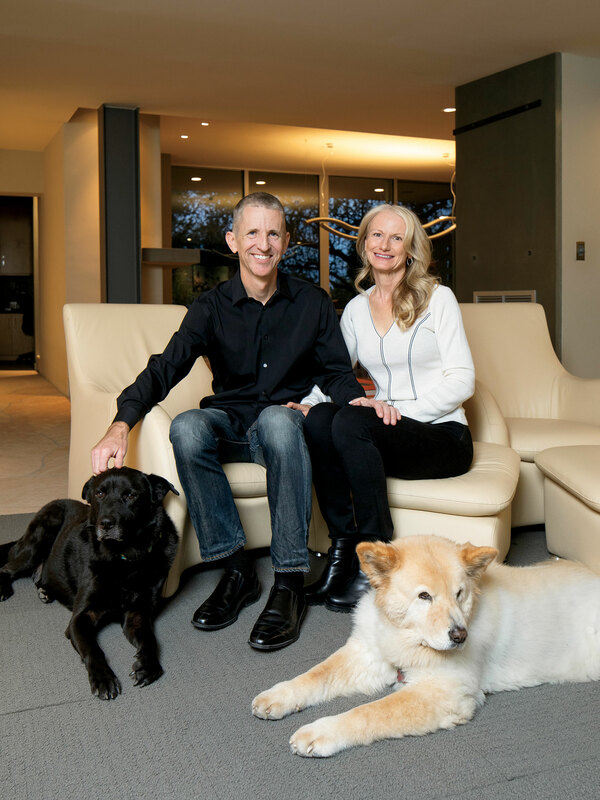 Ardent animal advocates, Chad and Sophia Little share their home with three rescue dogs. Shown here are Max (left) and Sasha. Next up for the couple is AHS’s signature fundraising event, Compassion with Fashion. Celebrating its 21st year, this annual lunch event features a designer fashion show presented by My Sister’s Closet and Well Suited, silent and live auctions, and a raffle of 16 adoptable pets. 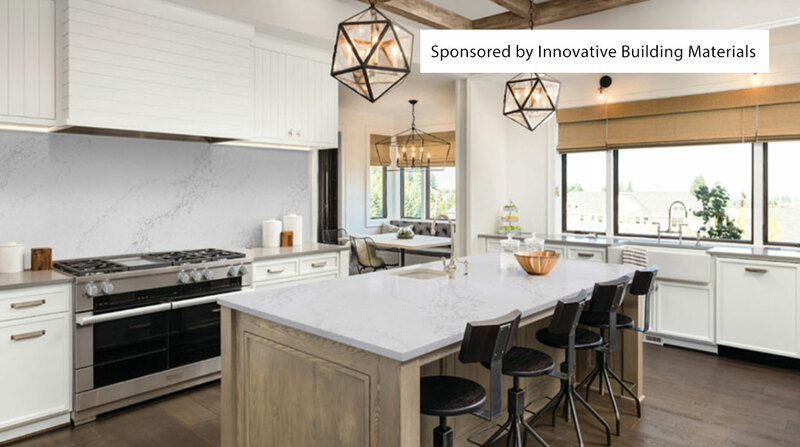 New in 2019 are custom dream pet houses, crafted by some of the Southwest’s top homebuilders, that will be available as part of the silent auction. A trio of images from the 2018 Compassion with Fashion fundraiser. “It’s a lighthearted and fun way to spend a Sunday afternoon,” says event co-chair Ann Siner. “Last year we raised almost $1.2 million,” says Ann Siner, who along with her sister Tess Loo co-chairs the event and provides the outfits for the fashion show. “To net that amount for a luncheon is really great. But now we put a lot of pressure on ourselves to exceed that this year.” Sophia is involved with Compassion with Fashion as a member of AHS’s Circle of Friends, which raises funds specifically earmarked to cover the costs of spay-neuter surgeries. Compassion with Fashion: In Pursuit of Dreams takes place March 31 at the Camelback Inn Resort and Spa. For additional information and to purchase tickets, visit azhumane.org/cwf.